The outdoor highlight of my Thanksgiving break was paddling on the bay. My uncle and I put in at Mission Creek and took out at the Dolphin Club. It’s an impressive paddle along the city’s sky scrapers, under the Bay Bridge and past a long line of piers. We started by sliding under the low draw bridges at high tide, sitting on our boards to get under them. After passing the ball park, we hit the open bay with a current in our favor. Conditions were calm. Every once in a while we’d pass people gathered on public access piers. They’d snap photos. We didn’t see any other paddlers out there. I’m looking forward to doing it again. The weekend also included a day of surfing in Pacifica, a bike ride, and an afternoon paddle on the American River. Awesome!!! 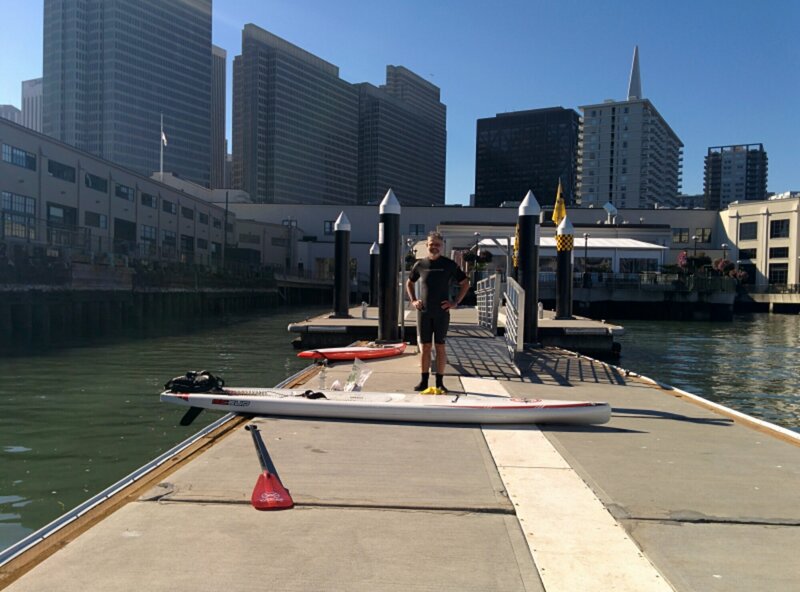 I just moved out to SF two weeks ago and was doing research on where to SUP around here, leading me to your post. Did you guys wear wet suits? Also about how long was the paddle between mission creek and dolphin club? SUPing on the bay is awesome! And not to be underestimated. Learn from the sea kayakers. Those are often more suitable for the bay and experienced kayakers have developed deep knowledge about the bay’s conditions. My uncle wore a shorty wetsuit, and I wore a full 3/4 surfing wetsuit that was pulled down to my waist. We had a great conditions for this paddle. Not sure about the mileage. It took us about two hours and we had a strong ebb in our favor. I’m excited about finding more places in the bay to paddle. We can do it pretty much anywhere!